Marvel is no longer the only movie studio in the superteam business. Without revealing any spoilers, Batman v Superman: Dawn of Justice feels like a lengthy mission statement from Warner Bros. and DC Entertainment about their own plans to create an interconnected superhero universe, albeit a statement that’s punctuated by explosions and combat. Unlike Marvel’s The Avengers, which fashioned its crew of crusaders as an uber-powerful Brat Pack, the dynamic between Batman and Superman begins with the pair at odds. From the moment the Man of Steel (Henry Cavill) appears in Gotham City in an effort to halt an attack that has caused great destruction, he is forced to face a populace that views him with panic and anger. Bruce Wayne (Ben Affleck) does nothing to quell the public’s reservations regarding Superman, as he views the son of Krypton as a rogue threat whose true motives are unclear, and Clark Kent doesn’t totally trust the vigilante of Gotham, either. This rift, and the lack of communication between the two gladiators, is catnip for the psychotic Lex Luthor (a hammy turn from Jesse Eisenberg), who is able to create an indestructible monster by framing Superman as a villain in order to distract the people of both Gotham and Metropolis. In the end, the fate of the universe hinges on Gal Gadot’s Wonder Woman (whose identity is discovered by a curious Wayne) as she tries to bring the duo together to fight the real enemy before they tear each other apart. 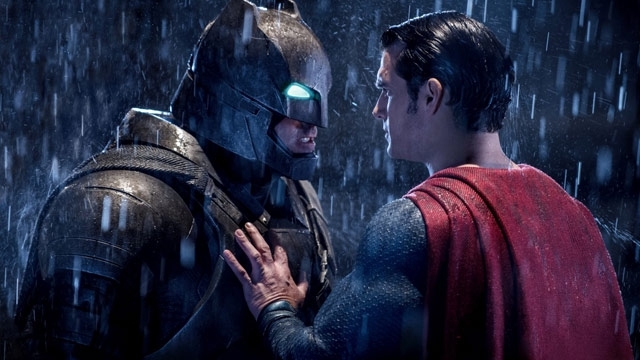 The constant action and destruction Batman v Superman offers will surely satisfy fanboys who have been waiting for the film’s big-budget mayhem. The overall critical reputation of Zack Snyder’s oeuvre (which includes 300, Watchmen, and Sucker Punch) has certainly been mixed, but no one can deny that the director is capable of crafting stunning visuals. That’s true here, as well: DC Entertainment has clearly spared no expense for this film, and the massive budget transforms Snyder’s grand ambitions of nihilistic destruction into an astonishing big-screen feast for the senses. The movie also features a number of new characters who make distinct impressions, such as Holly Hunter as Senator Finch, a steel-willed politician who appears to be the only person (or alien) able to see Luthor for who he truly is, and Gadot, who steals the show and stokes excitement for her own solo feature as Wonder Woman (set to arrive next year). Jeremy Irons owns each of his scenes as Alfred Pennyworth, Bruce Wayne’s wise and loyal butler. And the film is unafraid of tackling themes that previous comic-book movies have shied away from, including the flawed nature of our heroes and their inability to contain their outsized egos or combat their deep-seated fears. Like our central protagonists, however, Dawn of Justice is unmistakably flawed. The dialogue is incredibly clunky, as just about every character speaks mostly in melodramatic platitudes. The repetitive structure of the script—explosions, flashbacks/visions, grandstanding, more explosions, repeat—often undermines the impact of Snyder’s eye candy. Eisenberg, a highly talented thespian, is reduced to a scene-chewing caricature, as Luthor’s lack of charisma and laughable outbursts of bemusement and fury make us question why anyone would trust this clearly insane cartoon sketch of a person. Screenwriters David S. Goyer (Christopher Nolan’s Batman trilogy, Man of Steel) and Chris Terrio (Argo) both have impressive resumes, which makes the hacky storytelling devices used to convey Wayne’s inner turmoil and tortured past inexplicable and highly disappointing. And while DC clearly took notes from viewers upset with Amy Adams’ lack of screen time in Man of Steel, her involvement in this follow-up paints Superman’s historically strong-willed paramour Lois Lane as a mere damsel in distress who’s constantly finding herself in a jam. An actress of Adams’ caliber deserves better. This film is notable for being the beginning of a much larger franchise, which means the series has time to course correct by balancing the real-world questions it raises with a more focused central vision grounded in something closer to reality. Comic-book fans’ thirst for flashy heroics will surely be satisfied, but a monumental budget does not necessarily guarantee a classic.